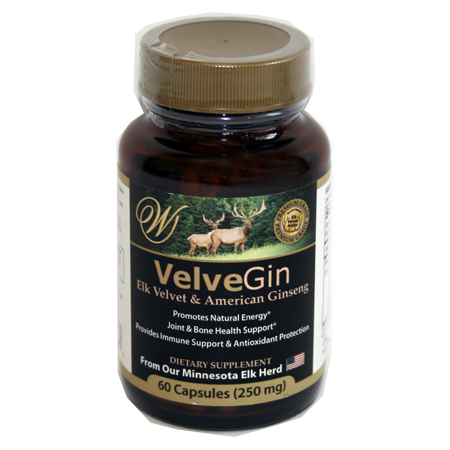 VelveLife | Elk Velvet Antler | Wapiti Labs, Inc. Thank you for making this product!! I have been using your VelveLife supplements for about two months now and it is making a dramatic difference in my life. Years ago I was in two severe car accidents. I sought out treatment from Doctors and Chiropractors with no relief for my chronic pain. I also have arthritis as a result. I was taking at least eight ibuprofen a day, and that was on my good days. Since I have been on your VelveLife I have not used any ibuprofen in a month, I cannot believe it!! I sincerely thank you for making an all natural product that has not only stopped my chronic pain, but I think it is helping to build my kidneys back up. I am sure that taking ibuprofen every day for extended amounts of time have taken a toll on my kidneys as well. I have been using this product for almost 1 year now, it is amazing how my body feels after intense work outs and long trail rides on my horse. My weakend left knee getting in the saddle no longer is weak and I can almost jump to the other side of my horse. Overall my body hurts less and feels great. Thank you for making this product. 1 Capsule (500mg) per 50 pounds of body weight daily.